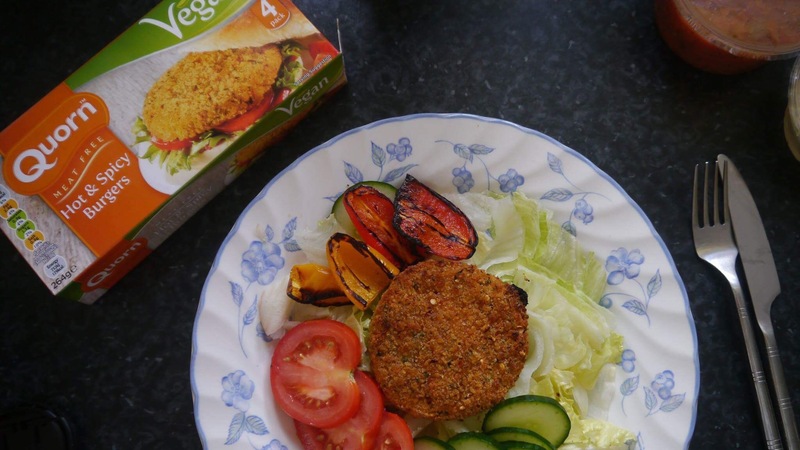 The first of the Quorn Vegan range has recently been released, which are their ‘chicken style pieces’ and these ‘hot and spicy burgers’. Already being stocked up on the chicken, I thought burgers would be something nice to try as there seems to be a lack of good burgers you can buy at the supermarkets (although the ones at restaurants such as Grill’d and Wild Thyme are delicious). These has a chicken style inside, with a crisp, breadcrumb coating and I’m happy to say are a truly great product! The ‘chicken’ doesn’t taste overly meaty, which for many veggies I know will be a plus, and the outside is spicier then I expected (I would definitely recommend having it with some cooling sauce like hummus or coleslaw) I’m excited to try more of Quorn’s new vegan range, including chicken nuggets (!!!!) and while they may be fairly small, at £2 a pack, working out at 50p a burger, I think is a really good price. A whole blog post about Quorn, their ingredients, products, and recipes will be coming soon so do keep an eye out if you’re looking for more meat substitute inspiration.